How can EQ-5D be used? The responses to the five EQ-5D dimensions (i.e. an EQ-5D health state or profile) can be converted into a single number called an index value. The index value reflects how good or bad the health state is according to the preferences of the general population of a country/region. The collection of index values for all possible EQ-5D states is called a value set. Value sets are currently available for the EQ-5D-3L and EQ-5D-5L for different countries/regions. Several valuation techniques have been used to generate these value sets: time trade-off (TTO), visual analogue scale (VAS), and more recently, discrete choice experiments (DCE). For the EQ-5D-5L a standardized valuation study protocol (called EQ-VT) was developed by the EuroQol Group to create standard value sets for the EQ-5D-5L. EQ-5D-5L users are recommended to use these standard values sets produced with EQ-VT. The starting point when selecting a value set is the anticipated use of the EQ-5D data. Once this decision has been made, a set of weights that represent the general population’s preferences might be the ideal system of choice, but such a system might not be available for your country/region. The following flowchart and considerations may help you to choose the most appropriate value set. For guidance on submissions to NICE please see NICE position statement. 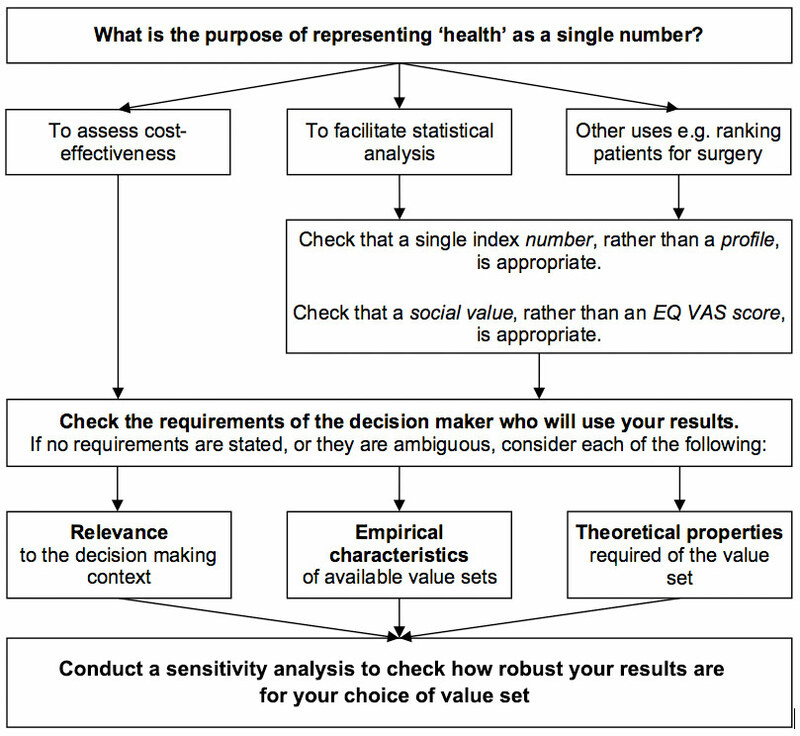 For economic studies where cost-utility analysis is anticipated, most health economists would recommend a choice-based based value set, derived from TTO or DCE data. If a choice-based value set is not available for your country/region, you can select a choice-based value set for a country/region that most closely approximates yours. Alternatively, you can use a VAS-based value set if that is available for your country/region. For economic studies where cost-utility analysis is not anticipated, either a VAS-, DCE- or a TTO value set can be used. If a value set is not available for your country/region, you can select a value set for a country/region that most closely approximates yours. If a standard EQ-5D-5L value set is not available for your country/region, then a so-called “crosswalk” value set can be used. A crosswalk value set is one that has been created for the EQ-5D-3L and then adapted to fit the EQ-5D-5L descriptive system. The crosswalk value sets were created by the EuroQol Group as an interim solution for use until national EQ-5D-5L value sets are available. Crosswalk value sets are based on a study that administered both the EQ-5D-3L and the EQ-5D-5L in a sample of 3691 patients with different diseases and from different countries/regions. More information on the crosswalk methodology can be found here and here. "EQ-5D is used worldwide | Value sets for the EQ-5D-5L and 3L for economic evaluation are available in a large and growing number of countries." "EQ-5D is robust | Extensive research has shown EQ-5D to be valid, reliable, and responsive in a wide range of conditions and populations." "EQ-5D is flexible | A dedicated youth version is available for children and adolescents (EQ-5D-Y)." "EQ-5D - a valid and reliable family of questionnaires (EQ-5D-5L, EQ-5D-3L, EQ-5D-Y) to describe and value health." "EQ-5D is used worldwide | EQ-5D-5L and 3L are currently available in over170 languages." "EQ-5D is the most widely used multi attribute utility (MAU) instrument for measuring health-related quality of life in cost-effectiveness analysis | The EQ-5D-3L was the most widely used MAU instrument in cost effectiveness analyses published in 2010, included in 77% of studies that reported the instrument used (Wisløff et al, 2014). [research to be undertaken to update this stat]." "EQ-5D is flexible | EQ-5D is available in electronic and paper formats as self-report, interviewer-based and proxy versions." EQ-5D is extensively used | EQ-5D has been used in trials, population studies, and real world clinical settings for over 25 years. It is recommended for use by a number of Health Technology Assessment bodies."